Newcastle delivers the best Sporting Schools basketball program in Australia. 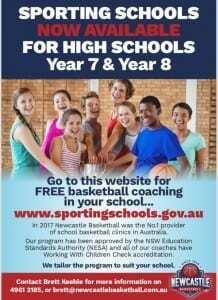 Sporting Schools is a government-funded program available to every primary and high school in the country and Newcastle Basketball covers every school in Newcastle, Lake Macquarie and Port Stephens. Teachers, click HERE to access your funding and we will deliver the best sporting program your students have ever had.